In the Gospel of John Chapter 8 we have the story of the woman caught in adultery and tells of continued confrontations with the Pharisees. After you've read the Scripture passage below, answer the following questions. It's a good idea to do them every day, so we offer to email the questions to you every day - just sign up below. Answer the questions below. You can download these questions to study the Gospel of John Chapter 8 on your own or with a partner if you like, or we can email the daily questions to you. If you want us to email the daily questions, just complete the form below. You will get 6 emails with the questions for each day. A seventh email will allow you to compare your answers and take you to Chapter 9. 1. Read Leviticus 20:10, Deuteronomy 22:13-22. Describe how each passage might have applied to the situation presented to Jesus. Also describe the appropriateness of stoning the woman as provided by the Pharisees in the Gospel of John Chapter 8. 2. What were the possible schemes devised for the trap mentioned in verse 6? 3. 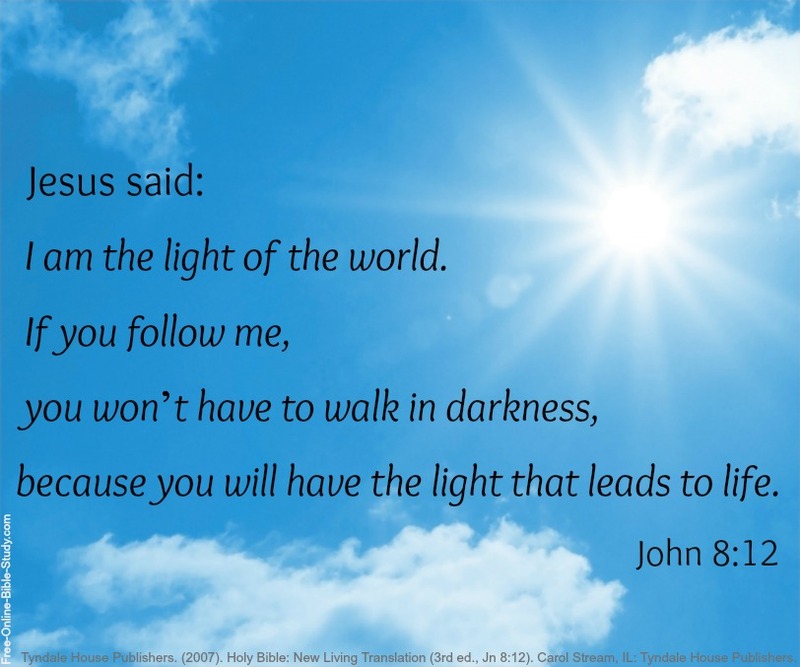 In verse 12 Jesus says "I am the light of the world: he that followeth me shall not walk in darkness, but shall have the light of life." After reading this chapter of the Gospel of John, how is light like life and how is death like darkness, or how are the terms symbolic or similar to life and death? 1. The Pharisees challenged Jesus in verse 13 that he was appearing as his own witness and therefore his testimony was not valid. Although we know none other was necessary, what other witnesses might Jesus have called upon in addition to the Father? 2. Who provided Jesus the validity of his testimony and any judgment he might pass? 3. Where is it written that the testimony of two men is valid as Jesus stated in verse 17? 1. In verse 19, why did Jesus answer the Pharisees question of "Where is your father?" with his reply “You know neither me nor my Father”? 2. What are the 4 truths Jesus states in verse 21? 3. What strikes you about the Jews' focus in verse 22 on the truth “Where I go, you cannot come"? 1. In verse 25, when Jesus is asked "Who are you?" He answers that He is just what he had been saying from the beginning. Who was He claiming to be all along in the Gospel of John? 2. When the Pharisees did not understand that Jesus was telling them about his Father, what 5 truths did Jesus offer them in verses 28 and 29? 3. In verse 31 Jesus states that we are really his disciples when we hold to his teaching. How do we hold to his teaching? 1. What are the 2 truths offered to the true disciples of Jesus Christ in the Gospel of John Chapter 8? 2. What is the truth that Jesus speaks of in verse 32? 3. In your opinion, how is a life of sin like a life of slavery? How is life different as a son as compared to a slave? 1. In verses 38 and 41 Jesus states that the Pharisees are doing what they have heard from their father, in fact, the very same things that their father does. What were they trying to do? 2. What 2 fathers did the Pharisees claim in verses 39 through 41? Who did Jesus state their father was? 3. In the Gospel of John Chapter 8 the Jews unfairly and prematurely judge Jesus. How have you prematurely or unfairly judged someone? How did you feel when you found out you were wrong? Did you ask forgiveness? Why did you make the mistake and what have you done to prevent a re-occurrence?